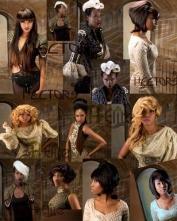 Hair Styles Only have honoured hector Obeng with a 12 page feature spread . A collection of his customed award winning weaves, using H-Elite hair.It has the perfect appearence and has the feel of relaxed like afro hair. With a tremendous swiss and bounce. It can last for 2 years. Full review in at blog:blackbeautyandhair.com by the production editor of Black beauty and hair; Jemmima cousins.